should i admit that i am unisex? will this cause grit teeth and a tight grip on money? for it holds one page and one rhythm. build a secure companion to give "support" and "comfort"
Matt Langley - Keyboards on Informative Timeline, pen-_-. Ales Johnson - Vocals on pen-_-. 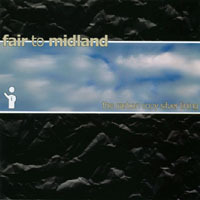 Copyright 2002 Fair to Midland. All rights reserved. Don't do it or we will kill you.